Born on 2nd June 1835 his birth name was Giuseppe Melchiorre Sarto. His Papacy began 5 August 1903 and ended upon his death on 20th August 1914. He died in the Apostolic Palace in the Vatican City. Pius X's canonisation took place in 1954. 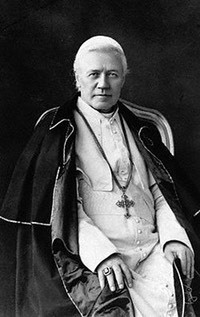 A great devotion developed around Pius X and to accommodate the large number of pilgrims seeking access to his tomb, far more than the crypt where he was buried would hold, "a small metal cross was set into the floor of the basilica," which read Pius Papa X, "so that the faithful might kneel down directly above the tomb". Masses were held near his tomb until 1930. 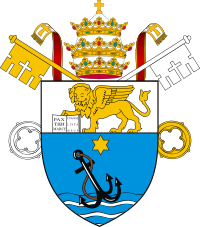 Following this, the process towards beatification began, and investigations by the Sacred Congregation of Rites into miracles performed by intercessory work of Pius X subsequently took place. The S.C.R. recognised two miracles. The first involved Sr. Marie-Fran�oise Deperras, a nun who had bone cancer and was cured on 7 December 1928 during a novena in which a relic of Pius X was placed on her chest. The second involved Sr. Benedetta De Maria, who had cancer, and in a novena started in 1938, she eventually touched a relic statue of Pius X and was cured. Pius X received his beatification on 3 June 1951 at St. Peter's Church and 100,000 faithful were in attendance. During his beatification decree, Pius X was referred to as "Pope of the Eucharist", in honor of Pius X's expansion of the rite to children. On 29 May 1954, less than three years after his beatification, Pius X was canonized, following the S.C.R. 's recognition of two more miracles. 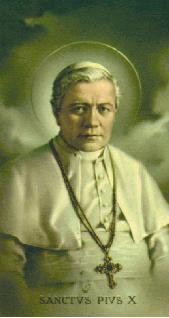 St. Pius X is the patron saint of first communicants.